No. 45, Jalan Mutiara Emas 5/16, Taman Mount Austin, 81100 Johor Bahru, Johor, Malaysia. CNC lathe, CNC Vertical Machining Center ,Lathe,Milling, Power Press , Guillotine Shears, Press brake, Surface Grinding, Drilling, Shaping, Slotting,Auto lathe & used machinery. 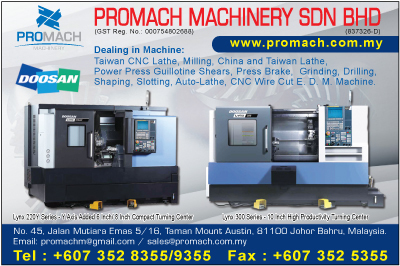 Supply and servicing of machineries and related operating software for use in the precision machining industries. There is no design of product in the business process as our company only involved in the sales and service of the product. Our principal or suppliers of the machines does the design of products. All our processes can be readily checked or verified for errors visually. Hence there is no process where the resulting output cannot be measured.